You are receiving this email because you are a member of the Danville-Alamo-Walnut Creek branch of AAUW. This is our monthly newsletter, providing you with event, program, and activity information. 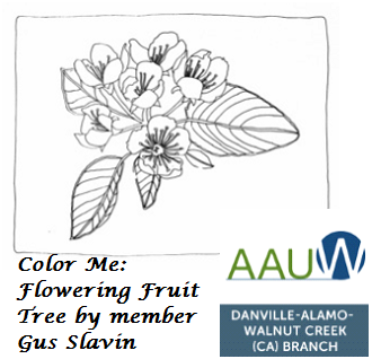 The Danville-Alamo-Walnut Creek branch promotes and supports our AAUW mission through local scholarships, AAUW program support, panel discussions, and topical guest speakers. Please share your art work! Each month offers the opportunity to highlight our members’ artistic talents in the banner of our Advocate newsletter. To be included, please send a JPEG or PNG formatted picture to our newsletter editor, Holly Sauer, at any time. If you are a writer, you may also send me a brief poem or excerpt that will fit into a space no larger than the size of a picture. This entry was posted in Uncategorized on March 17, 2016 by meblake.